(circa 800s) – a poet living among Viking warriors. 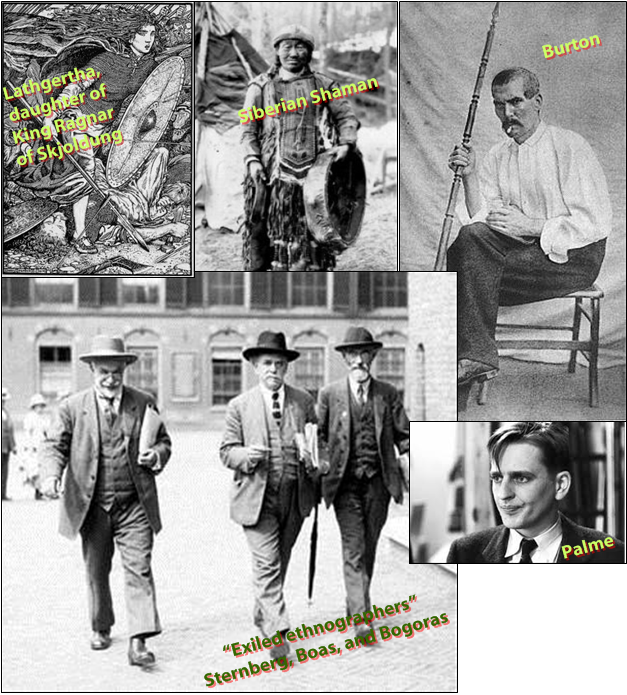 In the late 1800s, as western civilization struggled through various forms of political revolution, ethnologists such as Waldemar Bogoras and Lev Sternberg (both Russian), and Franz Boas (German), were busy trying to figure out how indigenous tribes of northern Russia and Canada fit into the changing modern world. Bogoras as a young man was arrested for his political views and exiled to Siberia (1889-99), where he visited and became fascinated with some of the native tribes. The fascination continued throughout his life and played a big role in his later achievements. Bogoras, Sternberg, and Boas were especially interested in making scientific sense of shamanism of the far north. Witch doctors were largely tabu to science, so the three men were exiled to some degree from the scientific community. Not an easy path at that time… walking the line between shamanism and science. In 1901 Bogoras took along a new-fangled recording device on a quest to visit a Chukchi tribe in Siberia. In a series of recording sessions, a Chukchi shaman was in one corner of a large tent, beating a drum and turning in circles in a trance-like state, performing a spirit-conjuring ritual. Bogoras was in the opposite corner, and the phonograph was positioned in the center of the tent, recording the sounds. Voices of spirits—some American, some Russian, some animal—came across loud and clear in the recordings. After Swedish Prime Minister Olof Palme was assassinated in 1986, he awakened in a snowy spirit world, still groggy and disoriented from his fresh and fatal wounds. He was found by a resident of that world, a Viking poet, or skald, named Skjoldung, who had died on Earth 1,200 years earlier. Skjoldung and his village nurtured Olof Palme back to health and vitality (in his spirit body, of course), and Palme soon journeyed from the Snowland spirit world to the Summerland, where he got settled into a pleasant afterlife existence. A decade after Palme’s death, in 1996, our Timestream spirit correspondent Richard Francis Burton paid Skjoldung a visit and gave us the whole scoop. Here are a few highlights from the story (with my comments) that give us a sense of spirit life and shamanism among the Vikings, and of diverse human eras and human places that spill over from Earth and interweave across time and space in the afterlife. My name is Skjoldung and I am a Dane. Ten years have passed, but today is the day I found this man. Every year on this day he comes back to us when we celebrate the feast day in our village. As I do every year, this evening I will once again describe how it happened. Our village Hleidhra is nearer to the snow-land than the Summerland which I have often traveled to. Some people from our village have gone there too, although many who were brave warriors on earth have looked for it but have not found it. In my short, 30-year life on earth I believed in Odin and Thor and it took me a long time after my death to understand that the story of Ragnaroek probably was not the right one. Meanwhile I got to know many gods, also the story of the one whom they call the true and only God and who is said to live somewhere far away in the mountains. One morning I met a group of Swedes who told me the oracle had predicted something special for our village. I had not paid much attention to it. I have met many here during my travels who claim to see events before they happen. Still, what these Swedes told me on that day had aroused my curiosity… so I was not too surprised when I heard a rustle in the underbrush and found a man with blood dripping from two wounds. His eyes were staring and his mouth was open. The hair stuck to his head. He wore a strange piece of clothing like they wear in Summerland…. I supported him and with my arms around him he staggered to Hleidhra, getting steadier as we came closer. He spoke of strange things, Burton, of something he called “Movie” and of two blows that hit him like blows with a hammer. He said his name was Olof Palme and he had to tell the world that he was still alive. When we reached the first houses of the village, he lost consciousness. I dropped him off at the Bohrer Inn…. He slept there for long weeks and when he left us he was a young man… and he told me, “I thank you, friend Skjoldung. You and your people have taught me much. I think I am ready to look for the Summerland, even though I was a “politician”. Burton, I imagine a “politician” in the country he came from must be a great prince, for he was a good man and we respect him highly. The name “Skjoldung” and the timeframe (some 1,200 years ago) suggest that this fellow during lifetime was probably a skald (court poet) for King Ragnar. I believe we’re getting a glimpse into several different spirit realms here. The spirits who interact with shamans on Earth are probably from the ‘shadow world,’ a sort of cloud of spiritual residue that surrounds our planet in a dense, nonphysical dimension. It’s not really a spirit world but more of an etheric shadow of our world. As I understand it, there are teams of clever scientists-in-spirit in the shadow world who work with ETs to create crop circles on Earth. Also teams of doctors-in-spirit who work with shamanic healers. On the down side, the shadow world teems with confused and troubled souls who move in and out of our world, spilling their confusion and troubles over into our lives… such as dense spirits of one gender who move into the carnal bodies of young, sensitive people of the other gender, creating a gender crisis. Generally speaking, the dispositions and motivations of residents of the shadow world are very much like what they had been on Earth… and their spirit bodies have many of the rough edges of carnal bodies… facial hair, skin blemishes, dark circles under the eyes, etc. People who start to migrate from the shadow world up to paradise, I believe, find themselves at the Second level, a transitional realm or holding place where they go through a refining of their thoughts and feelings. People of good intent who foster positive changes on Earth before they die (Olof Palme, for example), typically get settled into the Third or Fourth levels of spirit after they die… paradise. The Fourth level is sometimes called Summerland. To work with stable ITC systems (like the one that produced the Burton/Skjoldung/Palme text), the spirits need to be at the Third level, where people are still mentally and emotionally similar to us humans on Earth. Life at the Second level, or in the shadow world, is too chaotic to sustain stable ITC bridges, I suspect. At the Fourth level there’s a great deal of trust and good will and desire to serve others selflessly… to the degree that it’s no longer really compatible with noble-savage life on Earth. So ITC bridges with the Fourth level also cannot be created and sustained… a problem of resonance. To put that all in perspective, I believe that our material world is at the First level. I suspect the Viking warriors still inhabiting the ‘snow-land’ are probably somewhere at the Third level… along with countless other afterlife communities, including Timestream, that are very much like communities here on Earth. Some people on the Third level (those of good will and kindness) can visit the Fourth level, while other people on the Third level (those who still harbor feelings of earthly conflict and drama) can’t locate the Fourth level. In the next installment I plan to delve into troublesome and negative spirits and how they impact our world when working through a shaman. This entry was posted in Uncategorized and tagged Chukchi, olof palme afterlife, Richard Francis Burton, Siberian Shaman, skald, skjoldung, waldemar bogoras. Bookmark the permalink. It would be interesting to know what Ole Dammegard (www.lightonconspiracies.com) thinks about the afterlife, since he is so passionate about throwing light on the conspiracy behind Olof Palme’s assassination. It’s my experience that worldly dramas can distract us human from spiritual notions, especially when we get caught up in them… which is easy to do, since dramas are so stimulating to our carnal body-minds! So I suspect that most conspiracy theorists don’t think much about the afterlife.